NEW YORK (CNN) -- The U.S. government outlined a massive rescue package for Citigroup Monday that would inject another $20 billion into the ailing banking giant. 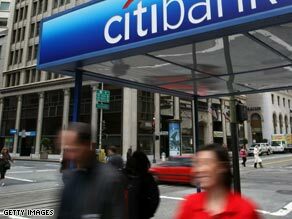 Banking giant Citigroup has announced it is cutting a further 50,000 staff as the economic crisis worsens. The additional $20 billion follows a $25 billion injection into Citigroup earlier this year as part of the $700 billion bank bailout Congress passed in October. Concerns about the fate of the 196-year-old firm's exposure to toxic mortgage assets rattled markets worldwide last week and saw Citigroup stock lose close to two-thirds of its value, ending Friday at below $4 a share. There had been fears that letting another major financial institution fail would have disastrous consequences for both the U.S. economy as well as the global financial system. Citigroup shares are now down around 87 percent this year, with more than $20 million in recorded losses. The bank, which has 200 million customers and operations in more than 100 countries, recently announced plans to lay off more than 50,000 workers from its 350,000-strong workforce. Citigroup would then cover 10 percent of losses above that amount, but with the Treasury and the Federal Deposit Insurance Corp shouldering the other 90 percent -- or around more than $300 billion in troubled assets. In return, the government will receive an additional $7 billion equity stake in the bank. Citigroup will pay an 8 percent dividend rate on those shares. Citigroup will also be expected to adjust mortgages for troubled borrowers, according to procedures outlined by the FDIC. In addition, Citigroup will be prohibited from paying out a dividend of more than a cent per share and will face limits on executive compensation. "With these transactions, the U.S. government is taking the actions necessary to strengthen the financial system and protect U.S. taxpayers and the U.S. economy," the Treasury, Federal Reserve and FDIC said in a joint statement announcing the plan. U.S. Federal Reserve Chairman Ben Bernanke and Timothy Geithner, president of the New York Fed, were both involved in weekend talks over Citigroup's fate, according to government officials. Geithner is expected to be nominated to be treasury secretary by President-elect Barack Obama. The most recent slide comes after news earlier this month that the Treasury was abandoning its initial rescue plan to buy troubled assets from banks. Citigroup had been seen as a major beneficiary of that strategy. Instead, as part of the October bailout package, the Treasury has focused on making direct investments in banks. In exchange for equity stakes, the government has put another $100 billion into eight other major financial institutions. But that rescue package has yet to calm markets.